232 pages | 19 B/W Illus. 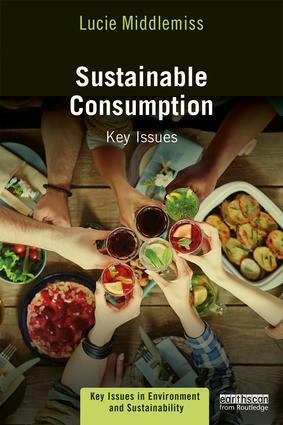 Sustainable Consumption: Key Issues provides a concise introduction to the field of sustainable consumption, outlining the contribution of the key disciplines in this multi-disciplinary area, and detailing the way in which both the problem and the potential for solutions are understood. Divided into three parts, the book begins by introducing the concept of sustainable consumption, outlining the environmental impacts of current consumption trends, and placing these impacts in social context. The central section looks at six contrasting explanations of sustainable consumption in the public domain, detailing the stories that are told about why people act in the way they do. This section also explores the theory and evidence around each of these stories, linking them to a range of disciplines and approaches in the social sciences. The final section takes a broader look at the solutions proposed by sustainable consumption scholars and practitioners, outlining the visions of the future that are put forward to counteract damage to environment and society. Each chapter highlights key authors and real-world examples to encourage students to broaden their understanding of the topic and to think critically about how their daily lives intersect with environmental and ethical issues. Exploring the ways in which critical thinking and an understanding of sustainable consumption can be used in daily life as well as in professional practice, this book is essential reading for students, academics, professionals and policy-makers with an interest in this growing field. Lucie Middlemiss is Associate Professor in Sustainability, and Co-director of the Sustainability Research Institute, in the School of Earth and Environment at the University of Leeds, UK.